Nathan Phillips, a Native American veteran, is speaking out after video of an apparent standoff with high school students going viral over the weekend. The National Mall in Washington, D.C., was the site for two competing demonstrations Friday: the March for Life and the Indigenous People's rally. Someone of the students " Make America Great Again" "Hats and one was standing inches away from Phillips as he sang and played his drum. 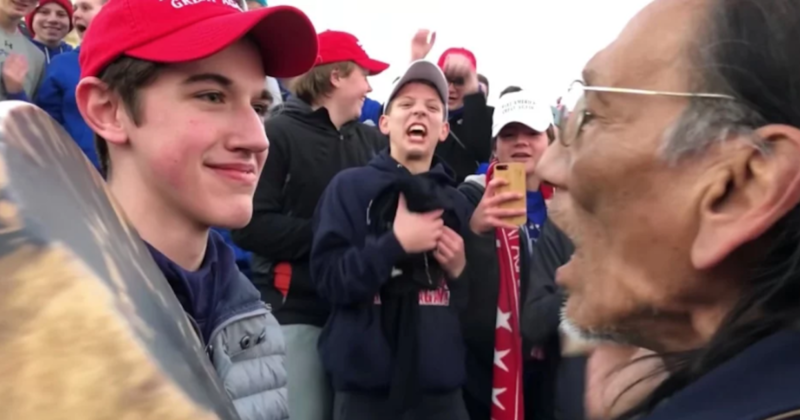 Nick Sandmann, a junior at Covington Catholic High School, said the four protesters began "hateful things" at him and his classmates. He said the students started chanting school spirit chants, with their chaperones' permission, to counter the slurs being yelled at them. "The chants are commonly used at sporting events. They are all positive in nature and sound like what you would hear at any high school, "Sandmann said in a statement, adding at no point did he hear any students chanting" build that wall "or anything" hateful. " Sandmann said he didn't speak to Phillips, nor did anyone block his path. He admitted he was confused as to why Phillips approached him. He said he was "startled and confused" as to why he had approached him after they were yelled at by the other protesters. Sandmann also thanked Phillips for his service and said he was "grateful to anyone who was able to defend our nation." Nathan Phillips will have more of his story on" CBS This Morning "on Mon, Jan. 21, 2019. Phillips said Sandmann "positioned himself" in front of him, stopping his exit. Phillips said he sang in front of Sandmann for about three minutes. "When the others were moving aside and letting me go, he decided that he wasn't going to do that. When I was coming up the steps, I saw he started putting himself in front of me, so I slided to the right, and he slided to the right. I slided to the left and he slid to the left – so by the time I got up to him, we were right in front He just positioned himself to make sure that he aligned himself with me, so that sort of stopped my exit. " Beginned asked Phillips if he thinks Sandmann should be punished.
" I wouldn't want to see nothing happen to him, I don't wake up trying to get out to hurt anyone, ever.Wake up in the morning, say my prayers.What can I do to make a better world? "Phillips added. "I think the one who should be punished are the supervisors. The ones who brought them to Washington, DC, to allow those youth to keep that way." He added, "There should have been an adult there, responsible to tell them, this is the wrong behavior. How did it come to be there to stand between youth and Americans who were exercising their right to freedom of speech? Freedom of religion. " The Diocese of Covington and Covington Catholic High School said it would be investigated and they would "take appropriate action, up to and including expulsion." "If you were to look him in the face again, what would you tell him?" Beganud asked Phillips.